The best one of the bunch? Let’s ask our pal Caesar . . .
Not quite. BUT a decent effort all the same. 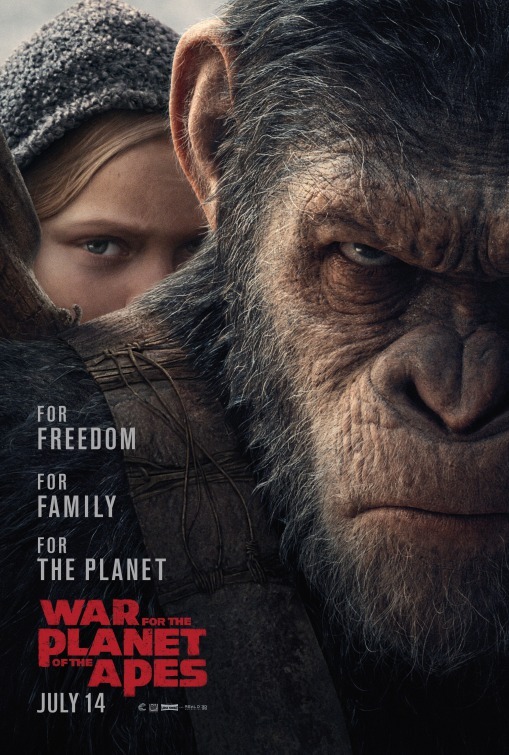 After the apes suffer unimaginable losses, Caesar (Andy Serkis) wrestles with his darker instincts and begins his own mythic quest to avenge his kind. I remember my reaction when I heard that the Planet of the Apes franchise was being rebooted/remade (again). It was very similar to ol’ Caesar’s. However, Rise of the Planet of the Apes was a welcome addition. I was completely surprised and engrossed. Completely caught up in the origin story of the super intelligent ape. BUT Dawn of the Apes on the other hand . . . NOT so much. A complete misfire. Bar Caesar’s fractious relationship with the ultra-violent Koba, I felt the sequel was hampered by poor pacing and a flimsy plot line. Needless to say, I was a little anxious on watching War. Wondering if it would suffer the same flaws and ruin what could have been an impressive trilogy. Luckily, I’m not saying that today. Andy Serkis was fantastic. How the hell that man hasn’t received an award for all the work he’s done surprises me (I mean, come on. Gollum, Kong and now Caesar!). It takes a lot more than wearing a green leotard and making monkey noises to bring life to these creatures. The movements, the expressions. I know it’s CGI BUT for two to three hours, you could almost believe they were real. The effects were impeccable. The detail. They deserve an Oscar nod for that alone. The first person PoV perspective as Caesar makes his introduction was brilliant. All his various monkey brethren bowing down and raising their hands in respect to their leader. The slow burning pace actually worked for the (majority of the) film and allowed the characters to develop quite nicely as Caesar fought against the advancing troops. Desperate not to cause a war. Only wanting to exist in peace. BUT of course, the humans have another plan in mind. There were a few twists and turns I didn’t expect as Caesar seeks vengeance. However, his clan won’t let him go it alone. And what a bunch of characters. Or should I say monkeys? Maurice the orangutan. Caesar’s overbearing conscience and protector. Forever keeping the angry ape in check. There was such a great dynamic between the group. I loved how the conversations flicked back and forth from sign language to talking. With Caesar as the only ape that can speak. Or so he thought . . .
Steve Zahn, take a bow! 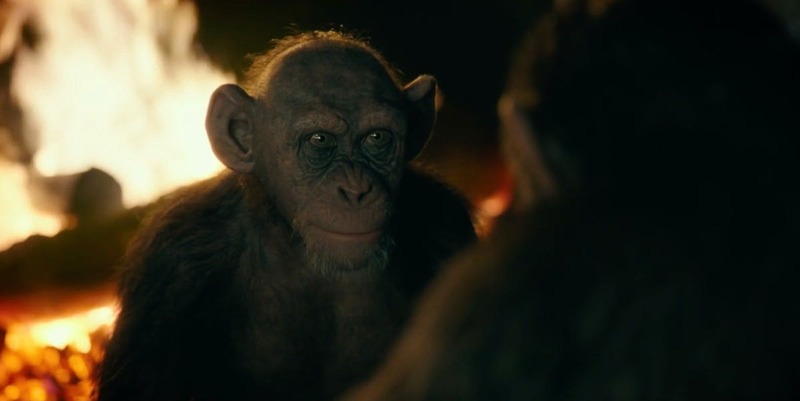 Sorry, Mr Serkis BUT there was one little chap that nearly stole the show and that was Bad Ape. It was at the 90 minute marker that I could feel my patience wading BUT once Bad Ape made his introduction. I was back in the mix. A loner chimp that escaped one of the compounds during the start of the outbreak. Picking up words in order to survive. A much needed comic relief to the sombre affair as he struggles to understand why Caesar would want to face the Colonel. I could easily watch a Maurice/Bad Ape spin-off. Those two were a fantastic duo. Things took a more interesting turn when Caesar and co stumbled across a mute girl named Nova (Amiah Miller). Flagging up all sorts of questions; why can’t she speak? A side effect of the virus? Will Caesar show mercy? And what a game changing performance from Woody Harrelson. I wasn’t sure if the Cheers star would be able to pull it off BUT once Caesar and The Colonel come face to face, I was on tenterhooks. There was a striking contrast that developed between these two stubborn leaders as they fought for their kind. Both suffering losses. BUT the Colonel (or Colonel Kurtz as I call him) was a man truly on the verge. Deluded in his own mission for finding the cure by wiping out all the apes. The action set pieces were exhilarating to watch. I just wish the length could have been cut by 30 minutes. The elongated Great Escape style compound sequence was too drawn out for my liking. There was only so much of Caesar wallowing in self-loathing that I could take. Don’t get me wrong, it set up a fiery finale BUT after all the build up, it all ended a bit flat. Almost abruptly. It was a fitting one BUT I still had questions that were hinted in the other efforts. For those who have seen it, I will impose my SPOILERIFIC question further down. I don’t think it goes without saying that you might need to watch Rise and Dawn to appreciate the little nods. BUT in all fairness, my mate got the gist and he chose to watch this one without seeing the others. So take your pick. It may have fell short of Rise BUT this was still a riveting visual masterstroke with some stellar turns. One of the better ones. I was just glad that I fought the urge not to sing this little gem. NOW *POSSIBLE SPOILERS* After Rise introduced the Liberty 1 expedition (Well, Icarus 1 – a reference to Heston’s spaceship in the original Planet of the Apes), will that still fit into this story line? Is there going to be another one? The girl was called Nova. A hint, maybe? Feel the fury! Well . . . Sort of. NO! It’s not another Marvel hero origins movie. Although how good would a Nick Fury movie be? Anyway . . .
David Ayer (Training Day/End of Watch) pens a hard hitting visceral war drama with the aid of a stellar cast. BUT with an overlong running time and a lagging middle act, it falls short of the greats. It has been a while since we had a war film and within the last two years, we have been rewarded with several. A little resurgence, almost. Not a bad thing at all. The only problem after so many classics (The Bridge on The River Kwai, The Great Escape, The Guns of Navarone to name a few); is the next film that follows merely a regurgitation? Saving Private Ryan and the equally brilliant Band of Brothers certainly broke that mould and proved otherwise BUT in the process left a tough act to follow. And I find it hard not to draw comparisons. The Monuments Men felt old before it even got a chance. A rehashed Dad’s Army with little on laughs and little on drama. Fury on the other hand . . .
“Ideals are peaceful. History is violent”. Let’s start with the good. You can normally bank on Brad Pitt. And he delivers another solid performance. 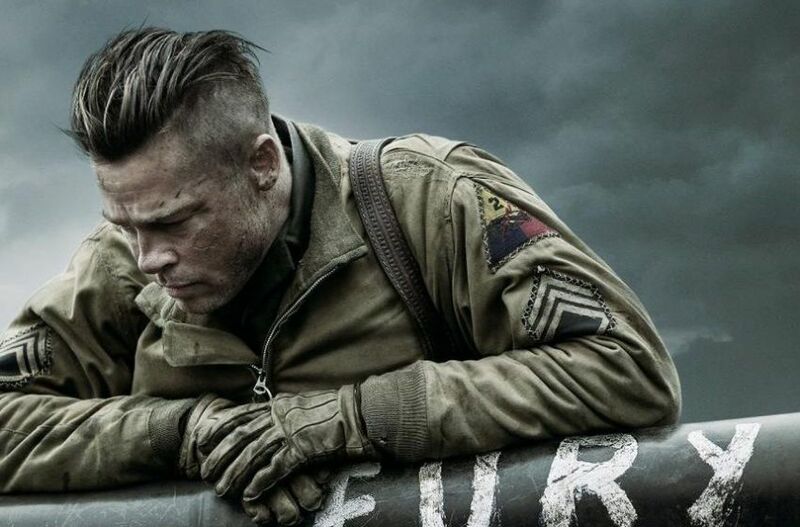 If you’re expecting Lieutenant Aldo Raine from Inglorious Basterds, you may be left feeling a little disappointed. But Pitt certainly brings a charismatic character to life in his expressions and posture alone. Where Ayer excels is in the little things; the impact the war has had on the soldiers psychologically. Of course, Ayer shows the level of chaos and destruction that has been brought to Germany as the Allies make the final push. An opening sequence in which we have nothing but silence as a German soldier rides a horse over a field of fallen men was both haunting and harrowing. Ayer makes an interesting commentary on the human condition. The fact that the soldiers no longer see themselves as human. They are simply killing machines, fighting for survival. The meal sequence perfectly demonstrated this. The scene may have dragged nearer the end and lulled what was a suspenseful and tense encounter but the point was still crucial. Lerman played the part well as fresh meat Norman Ellison, a typist who has been called up to help in the final push. The juxtaposition between him and Collier (Pitt) work brilliantly. His quick lessons of war by Collier hit home. The meal sequence was a perfect comparative piece as Collier (Pitt) and Ellison (Logan Lerman – Percy Jackson) attempt to have a moment of normalcy in which they sit at a table to have a meal with two German women. The rest of team inevitably crash the party. It was a perfect statement exemplifying that war changes everything and everyone. That normalcy is weakness but where it was interesting at first, it dragged on far too long. Jon Bernthal (The Walking Dead) was demented but also quite irritating as his character continued to yammer. Where I felt compassion for the man, I soon prayed for a bombshell to get him off the screen. Terrible to say for such a film. Shia LaBeouf (Transformers) was an unexpected surprise. After all the controversy surrounding his personal life and the rumours going around about his “method acting”; one particular rumour being that he actually pulled out one of his own teeth to get the feel of the character, he gave a good (and quite normal) performance. The action was brutal, graphic and violent. It made a change to have a tank warfare film (I can’t recall too many tank movies in particular). The set pieces in which the tanks battle against each other were brilliantly executed. The claustrophobia and pressure of fighting in a tank was captured perfectly. Ayer allowed for some moments of camaraderie between the rag tag team of misfits and showed how in sync they had to be to survive attack after attack. To be honest, I was happy to see more of that. The only problem is that the more explosions and battle sequences we got in the second half of the film, they seemed to mesh into one continuous sequence and what didn’t help is that some of the characters didn’t really shine as much as you anticipated. You felt empathy because of what they were fighting for but otherwise . . .
Michael Pena (End of Watch) was highly unmemorable merely repeating other character’s lines and stating the obvious, “That’s five against 300”. A shame considering how talented an actor he is. Bernthal’s indecipherable yammering did my nut in and after a while LaBeouf’s preaching prattled on a bit. The ending was tragically predictable which is a statement in itself as how many outcomes can there be in a war? I will certainly not forget what those men went through but will I remember this film? I mean Saving Private Ryan had an array of characters with such a simple story line but it had me engrossed, routing for them. Fury caught my attention but I could feel my eyes wavering over that watch again. The set pieces are good, if a little repetitive. The cast do their best if their characters are not as rounded as you would hope. Ayer delivers a visceral, if overlong, war drama but it didn’t quite hit it off for me.